The largest and most powerful sport fish migrating through our inshore waters during September is the mighty silver king. These magnificent fish are sought after world wide for their explosive bites, acrobatic leaps and hard runs. Tarpon are long lived fish, some of the older fish being over 60 years old. On average Lowcountry tarpon run in the 100-150 plus pound range so when you hook into one of these bruisers I would suggest hanging on for the ride. This is also a great month to fish the flats for tailing redfish. We have been catching the tailers regularly on light spinning rods using tube lures and they have also been taking well placed crab and shrimp patterned flies. By now the marsh is flooded with shrimp which is creating a feeding bonanza around the mid tides as the shrimp are being pushed back and forth through the creeks. 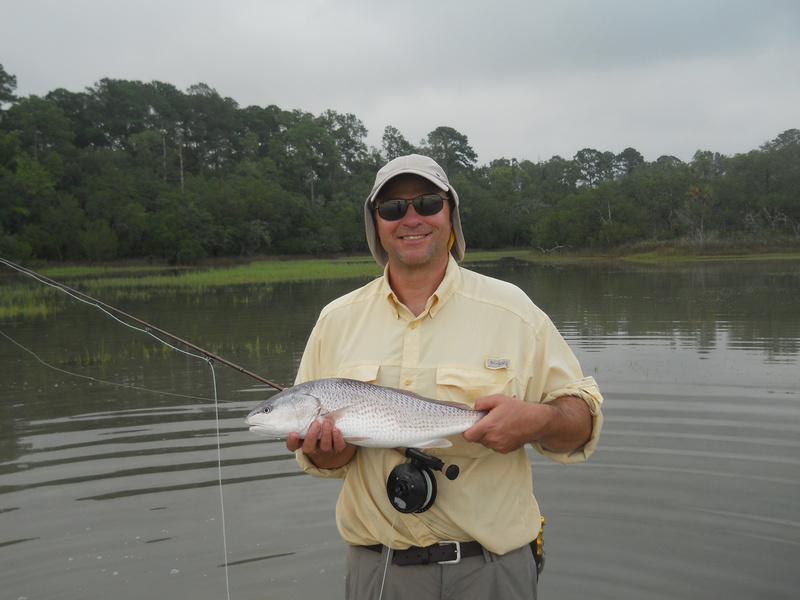 Fishing with live bait under a popping cork near the grass edges and oyster bars is a sure bet for redfish, speckled sea trout, ladyfish and jack crevalle. We have also been seeing some nice schools of ladyfish and jacks out in open water feeding on glass minnows which has given us some great action on the fly rod. When fish are schooled up and feeding on the surface you can throw just about anything at them and get a take so I have been keeping my 7 weight ready with a small clouser so that when we run across a school of fish we are ready for action. Nearshore, we should still be seeing nice schools of spanish mackerel, blue fish and jacks which can be seen from great distances as they push glass minnows and small squid to the surface. Finally, shrimp season has arrived…if you enjoy eating shrimp, try eating them on the same day that you caught them. Until next time, Catch em Up! This entry was posted on Thursday, August 9th, 2012 at 8:48 pm	and is filed under Recent Fishing Reports. You can follow any responses to this entry through the RSS 2.0 feed. You can leave a response, or trackback from your own site.